Today The British Columbia Regiment Irish Pipes and Drums (affectionately referred to as "the Irish") is an all-volunteer band made up of civilian women, men and youth of diverse ethnic origins. The members of the band finance their operation through many fundraising events and the kind donations of supporters. The band plays at various civic functions, charitable events, parades, and military functions in the Metro Vancouver Area. 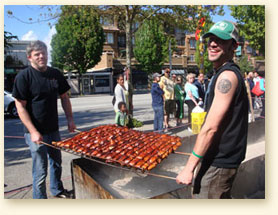 As well, members volunteer for community events like the 148 Legion's BBQ Chicken event every summer. On going: a number of young people have joined the band and are busy taking lessons. New comers who have some experience in Piping or Drumming would be welcome. Please contact Pipe Major Alistair Pattison. The B.C. 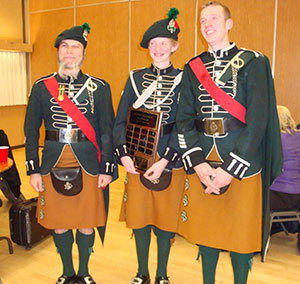 Regiment – Irish Pipes & Drums have undertaken a youth training program directed at youth who wish to learn Piping or Drumming with the objective of joining the Pipe Band. We have had 15 youth join the band over the last 12 years with 4 currently in training.